Sitting in the Atlantico Pavilion for the opening plenary session of the Lisbon convention, I found myself powerfully moved by the music of Il Divo. The quartet — Swiss tenor Urs Buhler, Spanish baritone Carlos Marin, French pop artist Sebastien Izambard, and American tenor David Miller — served as the closing entertainment for the session. As they belted out their rendition of “My Heart Will Go On” and “Somewhere,” I was filled with emotion. I could see the passion they were putting into their music. And it made me think about being passionate about what I do. Soulful, passionate music stirs our hearts. It reminds us how we long to find our place in the world, discover what our purpose is, and pursue it to the fullest. Several days ago, Rotaractor Elsa Soto Garcia blogged about the need to find what makes us come alive. I think she is right. And I think that is what Rotary is about. Helping people be the best they can be through service and high ethical standards. Yes Il Divo, music does have amazing power. And so does Rotary. 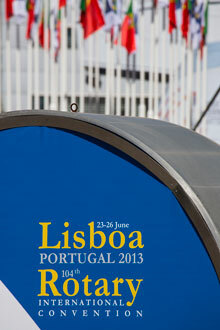 This entry was posted in Convention, Promoting peace and tagged 2013 RI Convention, Lisbon by Rotary International. Bookmark the permalink. The entertainment at the Lisbon Convention was just outstanding and yes, music brings people together! The concert for peace at the Closing Ceremony featured among many great talents a young man by the name of Fernando Varela. A native of Puerto Rico, residing in Central Florida, USA with an enormous voice, rivaling the great tenors of the past. If all goes well we’ll soon hear an see him at the World stage representing the youth an important component to the continued success of Rotary! Music is a combination of poetry and lyrics.It is based on language of poetry and move around the lyrics. Thanks for the Convention updates Arnold. Hope to hear more from you regarding next few days events. This is an Artist’s report.